Crimp beads are used to finish the end of a beaded piece of jewelry. They help to create a loop for a clasp to be attached to. Crimp beads are often used on jewelry that has been strung with beaded wire. This type of finishing bead can be used instead of a bead tip, or in addition to one, to maintain the knot inside the bead tip. They are considered a key element in the finishing of any beaded jewelry. The two most common types of crimp beads are tube-shaped and round-shaped. Tube-shaped are usually available in sterling silver or gold filled. Round-shaped crimp beads are commonly made of base metal. The tube-shaped crimp beads are often easier to work with and are recommended for anyone new to crimping and beading. Either variety of crimp beads are available to purchase in craft stores, bead stores, or online vendors. For most beads under 4 mm as well as small pearls, use .010 to .012 beading wire and 1x1 mm crimp beads. For most beads in the 4 to 8 mm range, possibly even 10 mm depending on bead weight, use .014 or .015 beading wire and 2x2 mm crimp beads. For most beads in the 10 mm and up range, use .019 to .024 beading wire and 3x3 mm crimp beads. 1x1 mm crimp beads should be used with micro crimpers. 2x2 mm crimp beads should be used with normal crimp pliers. 3x3 mm crimp beads should be used with mighty crimp pliers. There are so many variables when creating jewelry (bead size, bead shape, length of jewelry, the weight of beads, etc.) that there is no "one size fits all" answers to all bead stringing situations. A good rule of thumb is to make sure the wire and crimping beads are strong enough to support and properly close the beaded jewelry. Also, be sure that when you finish the jewelry, the end of the beading wire does not stick out. This could potentially scratch the wearer and be very uncomfortable. Make sure the last bead or two on the piece is large enough so that a small bit of extra beading wire can be rethreaded through those beads. 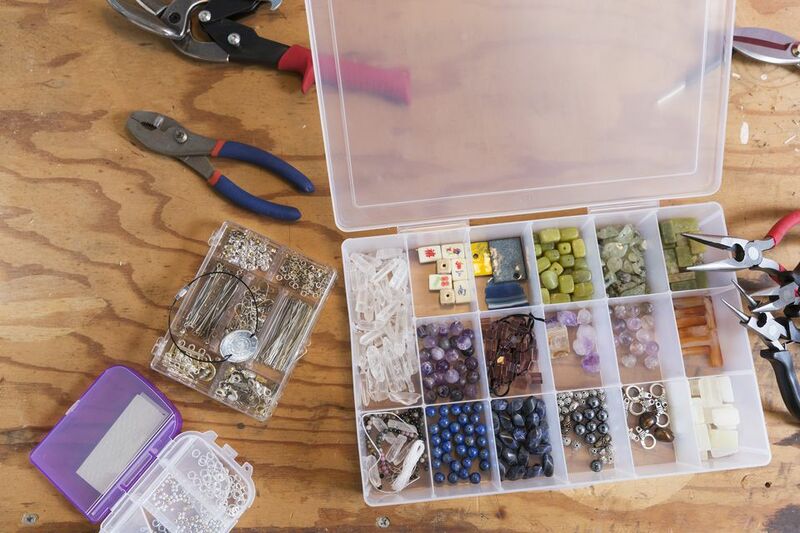 As with other jewelry making techniques, crimping and finishing takes time. Be patient and continue to practice to perfect your technique.